I own one pair of the Old Navy Rockstar jeans (in red – I wore here). However, I wasn't impressed with the materials or the fit. The fabric was stiff and not so comfortable. It also took me the longest time to find the right size. I ended up with a size 2 regular but the fit still isn't perfect. They bunched a bit around the crotch area. I popped into a local Old Navy yesterday because they are having a fantastic sale on denim right now. Due to my previous experience with their denim, I didn't have much hope. I am glad I decided to give their famous Rockstar jeans another try. Dare I say it? Because I found my perfect pair of jeans. These fit wonderfully (no waist gap, no bunching). I am a fan of the fact that I can get them at the exact inseam I need. I couldn't believe the measurements are dead-on (for me) in the waist, the hip measurement and even the leg opening! 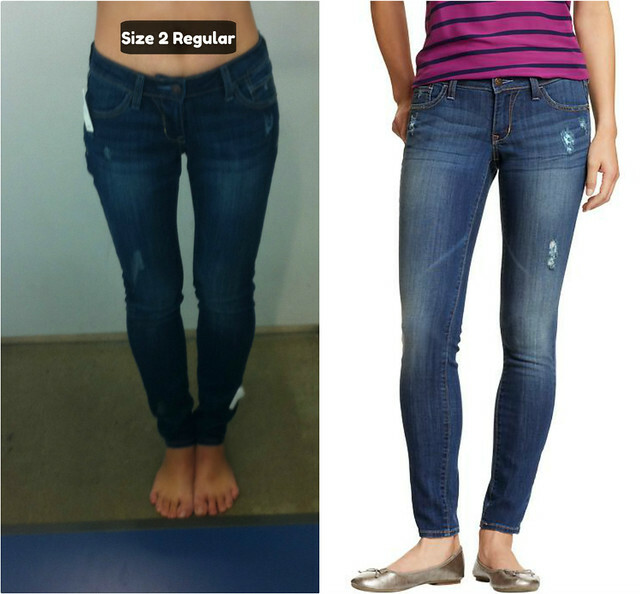 The measurements for a size 2 regular as follows: waist = 13”, length = 29”, hip = 30” and leg opening = 5”. They are my ideal measurements. Not only they fit great, the materials also feel wonderful next to the skin. Fabric composed of 98% cotton and 2% spandex. The combination of the higher quality cotton and spandex gives these jeans a soft texture, making them a step up from my other pair. I also tried on the lighter shade pair and the white ones. The lighter ones fit and feel identical to these. Although, I find the lighter shade denim less versatile. As for the white ones, the material is much thinner and for some reason, the inseam was a couple inches longer (same size). I passed on both. These jeans are currently on sale for $19 (was $34.50). If you’re in the market for new jeans, I highly recommend you give them a try. Up next is the Field Canvas jacket (comes in regular, tall and petite). Spring is just around the corner and it seems like everyone is looking for a military inspired jacket. I wasn't intended to look for one but stumbled upon the Field Canvas jacket and fell in love. I have a similar one from last year and have worn it quite a bit. Though, the color isn't as versatile and the length is a bit long for my short frame. I really like the color of this jacket. It is the true olive green instead of the more brownish khaki-olive. Although the jacket is unlined, the fabric (100% cotton) felt pretty sturdy and heavy-duty. I am wearing an XS here and the measurements are as follows: shoulder width: 15”, length = 24.5” and sleeve length = 23”. I also like the interior drawstring. It gives the jacket a cleaner look from the outside. This jacket is on sale online but still full-price in store. I didn't see the surplus khaki in store yesterday. I probably would be more interested in this color instead. I also tried on a few sweaters but didn't love enough to bring them home. These sweaters look and feel great in person. However, there is something off about them but I can't put my finger on what it is. Maybe the longer length? The cut? Not sure. 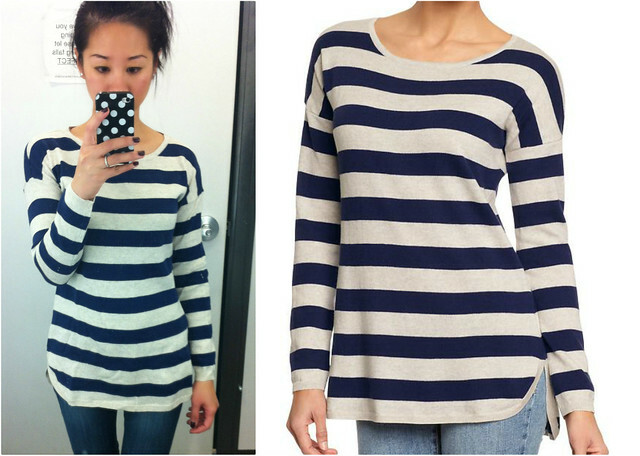 Overall, I am really impressed with Old Navy lately. They have definitely stepped up their games. 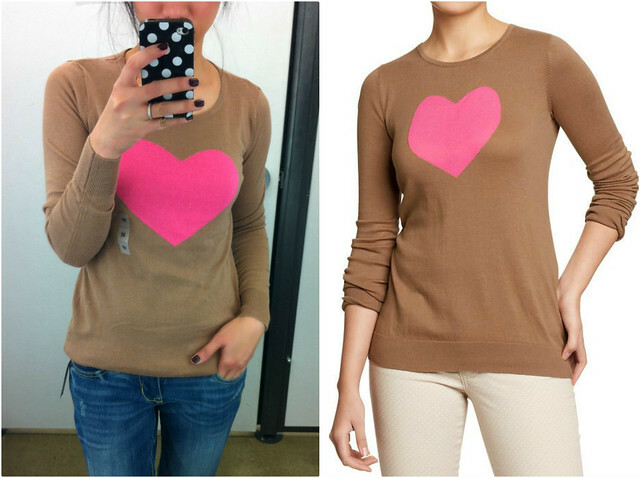 That heart sweater definitely looks a lot better on you than it does the model! I have a few pairs of the Rockstar jeans in purple, mustard, and red polka dot. Like you, the fit wasn't exactly perfect, but I've gotten them all on sale for less than $18.. and for that price, I could handle the slight bunching around the knee. ON has been churning out some pleasant surprises lately! Glad you found your perfect jean! It pains me that ON doesn't have more consistent sizing for similar items in just different fabrics. But I guess you get what you pay for! I like that the denim is soft and pliable. I tried on the maternity versions and they are quite stiff. Anywho, I have to do a return soon so maybe I'll see what else is in-store! I love the striped sweater but I know what you mean about something being off about it. I think it's the long length, not into it ! The denim Rockstars fit so much better than their colored ones!! Thanks for the heads up on the jacket - I've been looking for a less bulky, streamlined one like this! I am a sucker for Old Navy stuff. I just got 2 pairs of pointy flats and a monogrammed mint sweater yesterday. I hope you got that heart sweater because it is so cute on you! I love the ON Rockstar jeans, they are so comfortable and petite friendly! 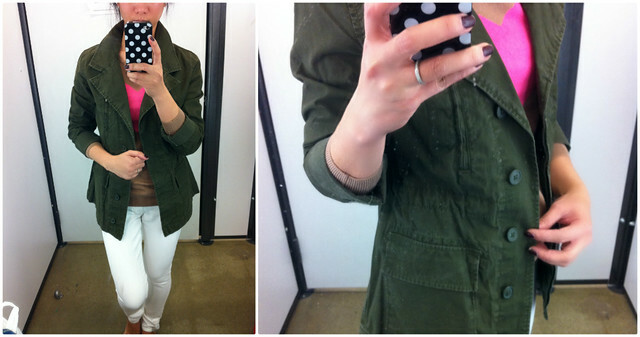 The field jacket is really cute too! Did you end up purchasing it?